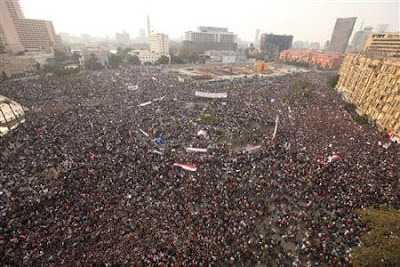 Village View Post: REVOLT IN EGYPT! These are historical times in the Arab world; one cataclysmic event after another is unfolding before our eyes. This is the story that everyone is talking about; the revolt in Egypt. Because I have lived in Israel and have relatives living there, many of my friends have been asking me to share my views on the uprising in Egypt. The truth is, Israelis are afraid. Afraid of what a radical take over of Egypt might mean to the southern border and the future ties with this Arab country that has a peace treaty with Israel for over 30 years. From my Israeli family and friends, for once in the Middle East, Israel has nothing to do with it. Israel stands alone as an island of democratic stability in the region and the most reliable ally of the United States. What Israel cares deeply about is for the peace treaty to be upheld and stability in the region. Instability is also convulsing Lebanon, Yemen, Algeria and Jordan, where today King Abdullah, a close ally of the US replaced his prime minister following protest inspired by the uprising in Tunisia and the revolt in Egypt. All this uprising shows just how different Israel is from all its neighbors. The events unfolding on the Arab streets in the region would be unthinkable in Tel Aviv or Jerusalem. Less than a year after declaring its independence, Israel held its first election in January, 1949 to a constituent assembly, which later became the Knesset. Although Israel was still at war with Arab states that invaded with the intention of destroying the new state, the election went ahead. Israel has since held 17 more elections, all unbroken by war, terrorism and the assassination of Prime Minister Yitzhak Rabin by an extremist to stop the peace process. In the last election in February 2009, 12 parties won seats in the Knesset, including three predominantly Arab parties as well as parties representing the Right, the Left, the Center and several strands of Orthodox Judaism. Democracy requires much more than holding elections. It requires freedom of the press, freedom of assembly, the freedom to communicate and organize. It requires an independent judiciary and a wide-ranging of non-governmental independent organizations representing groups such as labor, business, women, gays, immigrants, seniors, environmentalists, health advocates, and many more. Of course, corruption and abuse of power threaten any democracy. But when confronted with such problems, Israel has dealt with them even when they have occurred at the highest level. Other countries in the Middle East have held elections too, but they are usually one person, one vote. For now, the tens of thousands of protesters who took to the streets of Egypt over the weekend, there have been no cry yet of “Death to Israel”. So far it appears that the generals will tolerate the demand for change. In the coming hours, days or weeks we should expect to see a big change in Egypt. President Hosni Mubarak is a determined man, but his end is near. The pressure is building; Mubarak must go-Power to the people! Thanks for your comment Miriam,very much appreciated. Good article however, upon Israel’s establishment in 1948, its founders declared that the country would be not only a Jewish state, but also a democratic one, where all citizens, regardless of religion, ethnicity, race or gender, would live in peace with equal civil rights. Israeli Arabs constitute roughly 20 percent (1.4 million) of Israel’s population. They are, by definition, Palestinians whose ancestors remained in Israel and were granted citizenship after the state’s establishment. Following the 1967 Six-Day War, when Israel fought a defensive war against five armies amassed on its borders, Israel captured East Jerusalem from Jordan and opened up the holy places to all inhabitants including Muslims, Jews and Christians. Jews were banned from all holy site in East Jerusalem before 1967. Palestinian residents of East Jerusalem were given special identification cards and were offered citizenship, but most refused. Still, East Jerusalem Arabs maintain permanent resident status and can apply for citizenship. As permanent residents they receive Israeli social security and health benefits; subsidies for children; have the right to vote in local elections; and have the freedom to travel anywhere in Israel. Israeli Arabs, by and large, enjoy the same political and legal rights as Jewish citizens of Israel. However, as in many Western societies, Israel’s Arab population does suffer from discrimination. For example, Israeli laws such as the Right of Return and the Citizenship Law exclude Arabs; and there are limitations on land available for Arabs to purchase. However, they are allowed to purchase state-owned or privately owned land. Israeli law guarantees Arab citizens the right to express themselves publicly and to participate in the political process. Israel values democracy so highly that even movements opposed to Israel’s national existence are represented in the Knesset (Israeli parliament). Arabs, like all citizens, have a place in Israeli politics and a say in how the government functions, and can petition the government when they feel their rights have been violated. In addition, Arab citizens can turn to a variety of non-governmental organizations, such as the Association for Civil Rights in Israel (ACRI) and Adalah: The Legal Center for Minority Rights in Israel, to seek legal redress. Arabs have been elected to every Knesset since the founding of the State of Israel. At present, Israeli Arabs hold 13 seats in the Knesset, which has 120 members. 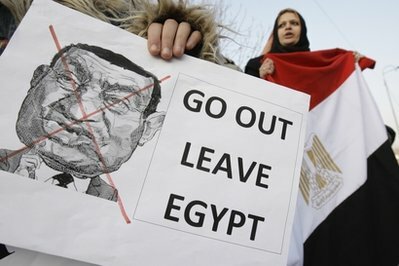 The Revolution in Egypt: Goodbye Mubarak!